Jacek Ciesielski – a dental surgeon, director and founder of the First Private Dental Clinic in Łodź. He graduated with honors from the Medical University in 1983, with the Rector’s Award for outstanding achievements in the study. 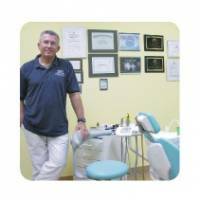 In 1986, he completed with excellent result first-grade specialization in general dentistry. As early as in 1984, he started private dental practice, the seat of which was transferred in 1991 to the Orbis Grand Hotel in Łódź. In that year, the clinic was equipped with the most modern facilities and devices used in dental treatment. In 2006, Private Dental Clinic Duodent moved to its present location – at 54, Armii Krajowej St.
Dr Jacek Ciesielski is the author of numerous publications concerning the methods of local anesthesia used in dentistry – including, in particular, the intraligamental (pressure) anesthesia method. Since 1986 postgraduate courses: 125 Polish and foreign certificates of attendance in courses on conservative dentistry, protetics, dental aesthetics, peridontology and orthodontics. Publications about the method of intra ligamentous anaesthesia . One’s own study of profitability in dentistry and price calculation in dental services. Workshop office hours in clinical performance of porcelain Veneers and of intra ligamentous anaesthesia, as well as teeth aesthetic reconstruction. Theory course on ‘Organizing dentistry after Polish integration into the EU-changes and new regulations’. 2003-cooperation with dentistry students in Łódź and Lublin. Co-organization of lectures and hands-on courses.